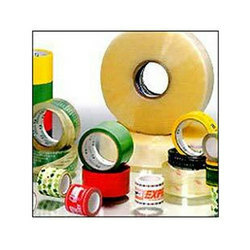 Prominent & Leading Manufacturer from Ahmedabad, we offer acrylic adhesive bopp tapes and bopp self adhesive tape. We offer our clients superior quality Acrylic Adhesive BOPP Tapes film coated with acrylic adhesive by latest state-of-art coating machine which is carefully formulated and produced to deliver high tackiness, uniform coating, greater holding power and adhesion strength. These self adhesive BOPP tapes have perfectly cross linked adhesive which provides internal molecule strength and elasticity. With no molecule distortion during succeeding operation, the adhesive lasts longer. The base film is also superior because of its bi axially orientation & shock proof characteristics. It resists splitting along the cartoons centre seal. Our self adhesive BOPP tapes are available in transparent, brown colored with rotogravure printing as per customer’s requirement available in different standard, width and coating gum. “Karnav Resources”, We manufacture, supply and export a comprehensive range of packaging supplies like laminated pouches, customized pouches, Food Packaging Pouches and Agricultural Pouches that find extensive usage across an assortment of industries such as food pharmaceuticals chemicals cosmetics pet foods agriculture and others. Looking for BOPP Tapes ?